Feeling Fictional: Fairyloot Unboxing - October 2017 "Villainous"
I know I'm really late posting my unboxings for both the October and November FairyLoot boxes but better late than never right? Even if nobody else is interested in reading these I like to keep a record of the subscription boxes I've purchased! This was another lovely box from Fairyloot with lots of brilliant items included in it. The first thing I found was this pretty Maleficient Candle from Meraki Candles. The scent is Jade Orchid & Lotus Blossom & it's gorgeous. Candles are definitely one of my favourite subscription box items so I love that Fairyloot include them regularly. The next item was this Moriarty inspired Villain Coaster designed by Evie Seo. I always love Evie's designs and this one is no exception, this has already become my favourite coaster for my morning coffee! I love this Death Eater enamel pin from House of Wonderland, I'm a HUGE Potterhead so of course I can never get enough HP merchandise! This lovely mirror by Little Inkling Designs is so cute and it's perfect for carrying around in your handbag. The quote comes from Marie Lu's Young Elites series which is actually one I've not read yet but have been meaning to get around to for such a long time. I think I need to push it to the top of my to read pile! This pretty print is another Evie Seo design, the quote comes from the poem The Aeneid by Virgil but you might recognise it from Cassandra Clare's Mortal Instruments series. I absolutely love Leigh Bardugo's Grisha series so I was really excited when I found out that this box would include a hardback of The Language of Thorns, an anthology of short stories and fairytales set in the world. This is such a beautiful book, not only does it have a pretty foil cover (I wish I'd been able to get that to show better on the photo!) but it's also illustrated throughout with such gorgeous images. I've already posted my review which includes pictures so you can read all about the book HERE if you're interested. 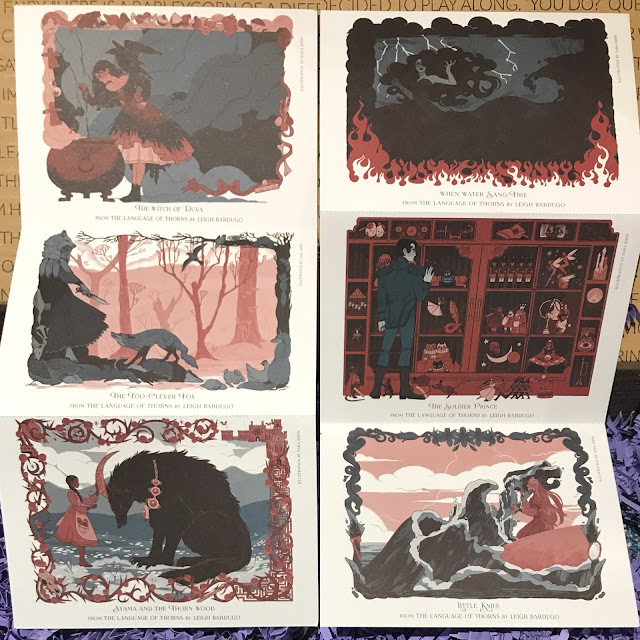 These gorgeous postcards with artwork from The Language of Thorns were also included in the box. Last but definitely not least was Forest of a Thousand Lanterns by Julie C Dao, this book is described as a reimagining of the evil queen from Snow White based on Asian folklore and mythology which sounds right up my street! It was already on my wish list so I'm definitely looking forward to diving into my copy. As with all the Fairyloot boxes the main book comes with a signed bookplate and a letter from the author which just makes it even more special. So that's everything that was included in the box, what do you think? I loved getting two books AND a bookish candle and all the other items were just lovely bonuses so I'm definitely impressed with this one. Thanks for another fab box Fairyloot!